Why did I read this book: The book had been under my radar since I heard that Flux was reissuing it. How did I get this book: ARC from BEA. I picked up an ARC of I’ll Get There. It Better Be Worth The Trip at BEA after reading about it on their website. This edition is the 40th anniversary edition of the book, first published in 1969 and it is recognised as the first LGBT YA mainstream novel to have addressed homosexuality in a positive manner. This edition also includes 3 interesting essays by Brent Hartinger (Geography Club), Martin Wilson (What They Always Tell Us), and Kathleen T. Horning (Director of the Cooperative Children’s Book Center), with a foreword by Stacey Donovan (Dive) niece of the author. These essays provide perfective and context for when the novel was first published and its importance seems to be twofold both on YA and LGBT contexts. With regards to the former, the majority of books for children or Young Adults at the time seemed to resort to storytelling for an idealised youth, with a tendency for moral lessons and this book offers a realistic portrayal of a teenage boy. As for the latter, suffice to say that the book was published only a few months before the Stonewall Riots and at that time, homosexuality was still classified as a psychological disorder by the American Psychiatric Association and was a crime in the majority of the estates. Important Historical context aside, what is the book about? About Davy, a 13yo boy, whose parents divorced when he was a kid and who ended up being raised by his grandmother. The book opens in the aftermath of his grandmother’s funeral with his family fighting over what is to become of Davy and he ends up having to move to NY to live with his self-centred, unstable, alcoholic mother. Luckily for Davy, he has his Dachshund (named Fred) , who is his best pal, with him. The story progresses to include Davy’s growing attachment to his father, who also lives in NY, and to Fred, his difficult relationship with his mom; and his budding friendship with a guy from school, Douglas Altshuler, a relationship that might grow into more after the two boys share a (very tame) kiss one day and a second (fade-to-black) making out session. Fred, his beloved dog dies. Of course he does. Now, I am not a dog person, I am not a fan of animals in books, because more often than not, I feel that these are needlessly exploitative and usually end up in death and tears. But Fred’s death got me in such a way, I cried a lot along with Davy. The book ends with a conversation with Altshuler and regardless of what happens next, they agree to at the very least respect each other and remain friends. Whether they become a couple is open for interpretation and it doesn’t really matter, they are only 13 after all. But the title to me is a clue: Davy will get there, to a positive place of self-acceptance which Altshuler seems to have already reached. And the trip will not be an easy one: friends will leave; his mother will not accept it but he has allies, he is not alone and in the end, it will be worth it. And I think it is awesome, that such a positive, intelligent book for Young Adults was written AND published when it was. That alone, makes the book way worth reading. “Then Father talks a lot about how hysterical people sometimes get when they discover that other people aren’t just what they are expected to be. He tells me there are Republicans who are always secretly disappointed when friends turn out to be Democrats, and Catholics who would like their friends to be Catholic, and so forth. He says that such people are narrow-minded he believes, and funny, too, unless they become hysterical about getting everyone to be just alike. Then they are dangerous. They become religious bigots, super-patriots, super-anti-patriots, and do I understand? I tell him I think I do, but can’t people learn to understand other people? He thinks they can, but only if they want to. Verdict: A groundbreaking novel for Young Adults and historical context aside, a pretty good one too. Well written, bittersweet and with flawed, realistic characters. I loved it. I really loved the book as well – and included that quote by his father in my review too 🙂 (Though it isn’t set to post for another few weeks.) It is so great! It sounds great, but I’m going to skip it. John Scalzi’s recent blog announcement sent me into a daylong tailspin during which I almost squeezed poor Rio to death. I don’t think I can handle that content right now. Thank you for mentioning the spoiler. It is one of my mental-buttons, I do not read books with the spoiler, I hate plots that use the spoiler and get upsets about it for days. So, my most sincere thanks for that spoiler. OK, so point one – I feel like an asshat of the first degree for not realizing something as profound as the Stonewall Riots. You learn something new everyday, but geeze. Maybe my head is buried six feet into the sand. This sounds like a really heartfelt and inspiring book. It’s wonderful that they are reissuing it and keeping it’s meaning alive. But I remain troubled by this book. I think it has a lot more problematic content than you addressed here. The boys *don’t* just shrug it off. Refer to this classic (and gutsy for the time) Michael Cart article: http://scholar.lib.vt.edu/ejournals/ALAN/fall97/cart.html “if we made out with some girls, we wouldn’t have to think about, you know, the other…” Huh?! “The other” and “it” … that seems oblique and unsatisfying for a world that now has Julie Anne Peters and David Levithan. I also didn’t read the ending anywhere near as open-ended as you did; it seemed more clear to me that they were ONLY going to be friends and that was that. Also, I’d think one of the reasons Fred’s death is SO upsetting is because of the not so subtle implication that homosexuality has a deathly consequence. That’s not just what Davy thinks, that’s what actually happens in the narrative. They kiss, the beloved dog who brought them both so much joy, acceptance, and affection is killed. Is this book worth reading? Is it worth academic study? Absolutely. Is it good that some queer teens of their generation found this book instead of, say, nothing or non-fiction books that told them they were unnatural? Without a doubt. I, personally, can’t wait to read the new essays. But here’s a real question I think is worth discussion: should public libraries buy this title for their young adult sections? Is this a title worth budget money? Does it belong on a shelf alongside titles like Boy Meets Boy, Luna, Rainbow Boys, A Love Story Starring My Dead Best Friend, Ash, What They Always Tell Us, and Geography Club? Should librarians spend collection development money on this title over actual contemporary queer YA novels? I will be purchasing this for my own collection and my own research and writing, but I won’t be buying it for my library’s collection and I wouldn’t recommend it for other public libraries either, especially when there are so many other queer YA titles they could be investing in. Hey Angie, thanks for your thoughful comment. I read your comment and the essay you linked to – thanks very much. Very interesting and I can definitely see where you both are coming from. The boys *don’t* just shrug it off. (…) “if we made out with some girls, we wouldn’t have to think about, you know, the other…” Huh?! “The other” and “it” … that seems oblique and unsatisfying for a world that now has Julie Anne Peters and David Levithan. Yes, you are right. They do say that. But I think the keyword from what you say above is “now”. Yes, “now” we do have these authors writing, BUT “now” we also have Civil Rights, we have homosexuality no longer being a crime or a disease. Back THEN, it was a wholly different thing. I think it is very realistic that two very young boys would react like that not only because of their age (so young!) but also because of the consequences given when they live and how queer=bad has been hammered in their minds. The fact that they feel quite ok about this and do kiss not once but twice is very positive. Yes, the dog dies. Yes, it can even be seen as a direct consequence – heck, that is what Davy thinks. Yes these are all in the text. But there are other things in the text as well, and we can’t forget those either. They say there is nothing to feel guilt about, Altshuler says he doesn’t feel guilty. It is also very clear in the text and subtext that Fred’s death is NOT linked to their making out. At least it was for me. I think this in itself addresses directly how in previous works yes, it was implied that “homosexuality = death” but here, there is death (hey, it is a fact of life) but it is NOT linked to their homosexuality. Maybe those are not enough now, but I think given the historical context, the book is very positive. Then again, I do appreciate the fact that I am heterosexual and possibly speaking from a place of privilege. because isn’t that how books -in this very genre – get challenged and banned? Also I just visited your blog – LOVE it. Yes, I think “back THEN” this book was something different and I think the back then parts make it worth discussion and worth reading. But that’s just part of the story. I don’t want to set it up as a “don’t buy books with queer content” issue because the question was more specific and not about should libraries have books with queer content at all. I specifically asked if this title “belonged on a shelf alongside” nine other titles (believe me, I could list many more) I think public libraries SHOULD own. The question I *am* asking: if you only have $15 to spend on a teen book for your library and you want one that has queer content in it should you buy Boy Meets Boy or Donovan’s book? Of course, this is a question each librarian must answer for their own community, but I personally can’t think of a single thing that would recommend Donovan’s title to contemporary teen readers over Levithan’s. This decision is a reality for many small libraries or for libraries struggling with smaller budgets. The question now for these budgets and these librarians is not “Should I get a book with queer content?” but “Which book with queer content should I get?” (if the question is the former, its an entirely different conversation. My worry is that librarians asking that question might answer with Donovan’s book because it has a more “retro” and thus seemingly “safe” message than one of, say, Levithan’s titles.) I just don’t think the answer is “one that’s 40 years old and has problematic content.” Because I think we can agree that there IS problematic content here. It might not be the whole text, but it’s there. And while maybe no text is without problems, I think librarians can do better than this for their queer YA collection development. ALSO, just read your review of the Duff – I was terrified of reading the book but you convinced me to read it for the final week of YAAM. Enjoyed the spirited debate here! Angie, I see your points, though I’m more with Ana on this one. I guess I more appreciated the book for its solid writing–in that regard, I do think it holds up well. It’s for sure not a “gay power” novel, or overly gay-affirming. And if the choice comes down to a few books, perhaps more modern ones are the way to go (and thanks for inclkuding mine in that nice list!). But it’s still subtle and powerful, I think, even in 2010. anyway, great post, and great comments/debate! 🙂 also, I am happy to now have two new blogs to follow! 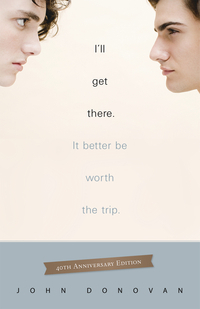 I first read “I’ll Get There, It Better Be Worth The Trip” in 1969, shortly after it had been published. I discovered it while browsing in the Young Adults section of my local public library (it was a recent addition to the library’s collection). It looked interesting so I checked the booked out from the library, but I had no idea of the full content until I got home and started reading it. At the time, I was close in age to the protagonist, Davy (I turned 13 in December of 1969). As I read the book I found that I related to Davy in so many ways; I was an only child, a lonely child, the child of a very dysfunctional marriage (including an alcoholic parent) and was feeling the awakenings of my own homosexuality. In short, reading this book was one of the most profound experiences of my adolescence and it has stayed with me throughout my life (I just turned 55). A few years ago I came across a copy of it (an original edition) at a bookstall in a flea market, purely by chance. I bought it without hesitation, reread it and it still had the same poignant significance for me that it did when I was 12. I only wish that Mr. Donovan were still alive so that I could thank him for helping this lonely boy through some very difficult times in his early life. This book is a masterpiece.